Sorrento in the Park is the finest conference and business function venue you will find in the city. We are located inside the picturesque Cornwall Park, providing you a unique mix of a convenient central location and a tranquil park. At Sorrento, you can escape from the usual chaos of the city. 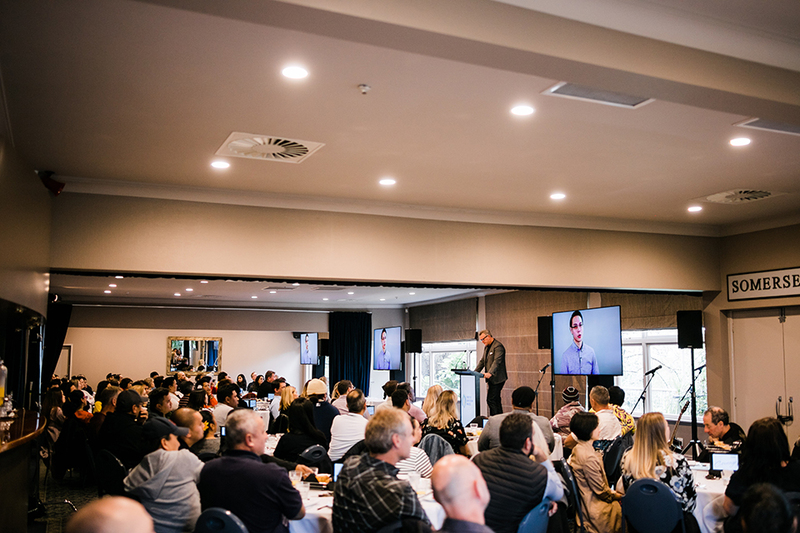 Here, you have a choice of different conference packages and venues, starting from our 220-seater theatre style Manukau Room, to more intimate spaces like the Pohutukawa Room (180 seats) and the Somerset Room (60 seats). Our packages are highly flexible to tailor to your needs and rooms decorated and set according to your specifications. Sorrento in the Park offers complete conference catering and special dietary requirements are accommodated with prior notice. We can provide you with basic audio-visual equipment to meet your requirements, ranging from flipchart stands, papers, and pens, to screens, electronic whiteboards, data projectors, whiteboards and markers, and daily internet access. The venue is available for hire on weekdays from 7:30am to 5:00pm. Should you wish to relax at the completion of your conference day, we are a fully licensed facility. As responsible hosts, we encourage consumption of food with alcohol and can offer a selection of tasty finger foods from $12.50 per person. We can provide you with all your audio-visual requirements. All equipment is set-up, tested and ready for use prior to your guests’ arrival. Should you wish to relax at the completion of your conference day we are a fully licensed facility. As responsible hosts we encourage food with alcohol and can offer a selection of tasty finger foods from $12.50 per person. All rooms will be set according to client specification, all dressed with fine quality linen. Additional hours incur an additional cost of $75.00 per hour or part thereof. We use Sorrento four to five times every year for functions that run from business seminars to Awards dinners. They are our number one choice of venue in Auckland because the owners/staff are friendly and efficient to deal with, the location is central, with plenty of parking, the setting is beautiful, the food and service is outstanding and they are very flexible and accommodating.